We have Mrs Claus plus elves available for your Christmas parties. Mrs Claus can talk to the children assist them with their crafts and cookie decorating. Mrs Claus is always very popular especially with children who might be a little scared of Santa. She is always a huge hit with adults too and is just at home with a room full of adults as with children. She can talk to the children about their wishes, tell them what’s happening in the North Pole, assist them with their crafts and cookie decorating. 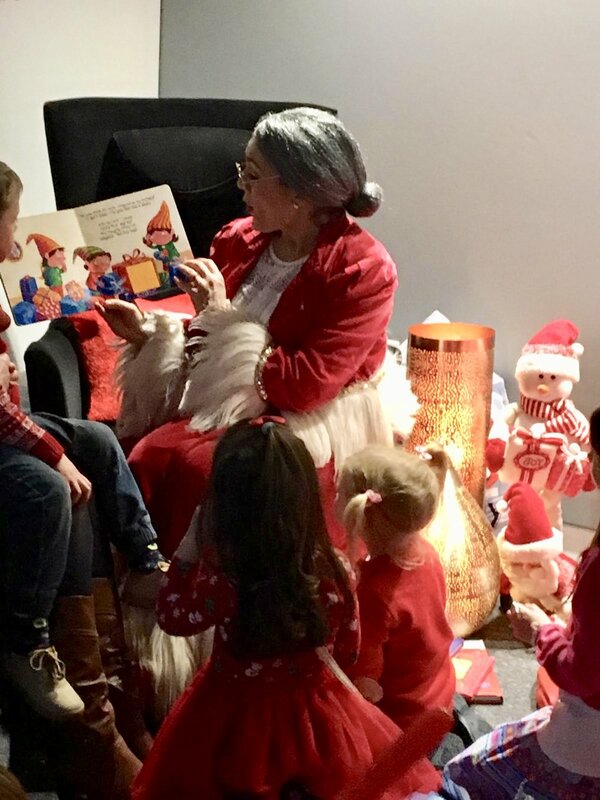 Mrs Claus loves reading stories to the little ones. She can hand out gifts or selection boxes that you provide (or we can organise this for you) Make sure to get some photos. She loves to hear what your little ones want for Christmas… she can let Santa know! Plan your event, Let’s make a magic memory! Plan a breakfast, while your guests/family are eating , Mrs Clause will mingle around the room, play games and provide Christmas music. You can also choose from the other activities. She is always willing to pose for photos. Tired of waiting in line at the shopping centre with people you don’t know and bored children (maybe even your own). Why not host a neighbourhood party? Mrs Claus can come to your home/clubhouse /community centre. You can spread the cost among the families involved. You may want to buy your own gifts or selection boxes for the children or we can do that for you. Mrs Claus can do Storytelling, arts and crafts , provide Christmas music and hear the children’s wishes. Invite mrs Clause and her elves to your event, activities can include Arts and Crafts, Storytelling, Balloon Modelling and Christmas Face Painting. Mrs Clause is always welcome no matter what the age group. If you are interested in adding more to your party you may also invite some of our lovely elves along to your event. Planning a fun at-home kid’s birthday party?